Ranunculus lapponicus is considered a circumpolar species, which means it ranges around the earth in arctic and boreal latitudes. In North America it ranges south to Minnesota, Wisconsin, Michigan, and Maine. It is considered rare or endangered in all four of those states. It is certainly rare in Minnesota, although the number of known sites now exceeds 50. The concern is not related directly to the number of plants or populations, but rather to the sensitivity of the wetland habitat upon which it depends. The wetlands, primarily classified as rich forested swamps, are typically part of extensive hydrologic systems dependent on a stable and uninterrupted supply of groundwater. Given these concerns, R. lapponicus was listed as a special concern species in Minnesota in 1984. Ranunculus lapponicus is a small, herbaceous perennial only a few inches high. The stems are smooth and grow prostrate on or just below the surface of the ground. The nodes of the stem will root in a moist environment. The leaves are on long, slender petioles with blades 1.1-2.6 cm (0.4-1.0 in.) long and 1.6-4.3 cm (0.6-1.7 in.) wide. Each leaf blade is divided into 3 rounded segments. Each segment is undivided or may have one or a few clefts. The flowers occur singly on long, slender stalks and have 5-8 small, yellow petals, each 5-6 mm (0.20-0.24 in.) long and 2-3 mm (0.08-0.12 in.) wide. There are 3 greenish sepals about the same size as the petals. The fruit is a hemispheric head of achenes 8-10 mm (0.31-0.39 in.) across. The individual achenes are glabrous, 3.8-4.2 mm (0.15-0.17 in.) long and 2-2.2 mm (0.08-0.09 in.) wide. The tip of each achene has a curved or hooked tip 1.6-2.4 mm (0.06-0.09 in.) long (Benson 1948; Whittemore 1997). Ranunculus lapponicus is most likely to be confused with the common Coptis trifolia (goldthread). They can be told apart by comparing the leaf, which has small, sharply pointed teeth along the margin in the case of C. trifolia, and broad rounded lobes in the case of R. lapponicus. The habitat of R. lapponicus in Minnesota falls within the category of rich forested swamp, usually under a canopy of Thuja occidentalis (northern white cedar) or Picea mariana (black spruce). It is also known to persist in low numbers in rich alder swamps where cedars were present in the past. Within these communities, there is typically a carpet of Sphagnum mosses or brown mosses, which may form low mounds called hummocks. Muck-bottomed hollows with a few inches of water will be scattered about, and it is likely that R. lapponicus can be found on the moss hummocks and at the margins of hollows. The species often occurs in loose carpets or patches (comprised mostly of leaves) in moist hollows that are too shallow to hold standing water. Stems of R. lapponicus have the ability to spread just below the surface of a mossy substrate and root at the nodes. The root crowns that are created in this manner can survive the winter even though the stems that originally connected them die back at the end of each growing season. This process of vegetative reproduction is capable of resulting in large colonies that sometimes cover many square meters. 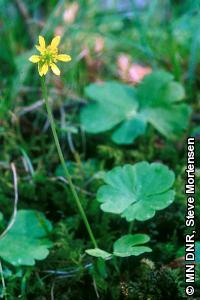 Ranunculus lapponicus is also capable of sexual reproduction, which is accomplished by insect-pollinated flowers. It appears that pollinators are small flying insects, although specific pollinators have not been identified. The seeds are small achenes that have no specialized structures to aid dispersal. At least they do not have tufts of hair that might allow them to float on air currents, or burs to catch in animal fur. It seems likely that they are spread by small animals that might gather them for food, and possibly by water currents that might flow through habitats in the spring after the snow has melted or after especially heavy rains. The flowers of R. lapponicus usually appear during the last part of May through the end of June. Although the flowers are small, their presence may make searching easier. If flowers are not present, the shape of the leaves and the growth form of the plant still make identification possible. It appears that R. lapponicus does not need any special management considerations beyond that which is required to maintain a healthy, full-functioning community of native plants within the wetland habitat where it occurs. Insect pollinators should also be considered an essential part of the community. It is generally understood that the delicate and sensitive hydrologic regimes of these wetland habitats are extremely vulnerable to disruption. For that reason, any significant land use activity in or near R. lapponicus habitat must be given close scrutiny. The two activities most likely to come into conflict with this objective are timber harvesting and road building. Perhaps half of the known populations of R. lapponicus in Minnesota occur in forests under the jurisdiction of the Minnesota Department of Natural Resources or the U.S. Department of Agriculture. In most cases these forests are managed for timber production, although the swamp forests in which R. lapponicus is most likely to occur do not have high-value timber and tend to be on a long-rotation for timber harvest. Benson, L. 1948. A treatise on the North American Ranunculi. The American Midland Naturalist 40(1):1-261. Whittemore, A. T. 1997. Ranunculus. Pages 88-134 in Flora of North America Editorial Committee, editors. Flora of North America north of Mexico. Volume 3. Oxford University Press, New York, New York.